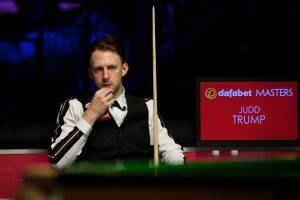 Judd Trump stood out not only with his performance but also his outfit as he beat Liang Wenbo 6-4 to reach the quarter-finals of the Dafabet Masters 2018 at Alexandra Palace. Sporting a new striped Christian Dior shirt, world number three Trump showed some impressive performance under pressure as he made his eighth Masters appearance. “It’s just a shirt, it doesn’t make me play any better!” Trump joked about the outfit. Liang had a chance to force a decider early in 10th frame, but missed a risky pot on the green to a baulk corner, and Trump took this opportunity to punished him with a match-winning 85 break.